I've suddenly found myself at an age when my School and University friends are doing incredibly grown-up things like buying houses, getting engaged, having actual weddings and making tiny people, and tomorrow I am attending my very first Hen Party for one of my best friends and I am super-bloody-excited. 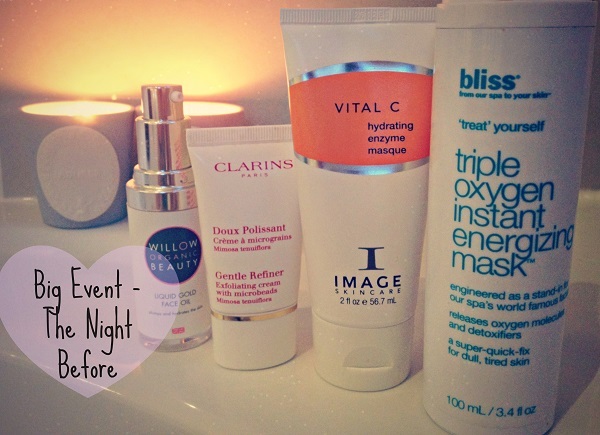 The night before an important event is all about ensuring your skin looks radiant, healthy and glowing.It is definitely NOT the time for deep cleansing facials, extractions, microdermabrasions, dermarollers, blackhead/pore strips, clay masks or anything at all that is even remotely harsh on the skin. The last thing in the world you need is to encourage redness, flakiness or blemishes to rear their pesky heads resulting in greeting you with a cheery good morning wave as you peer into the mirror on the morning of the big day. No, the night before is about soothing, re-hydrating and brightening - and I shall fill you in on my secret weapons. First things first, I located my glorious Ladurée scented candles because I'm going to a Hen Do which is obviously for a wedding which means people are getting married and that means, apparently, I am at the age of a proper grown up person and proper grown up people have candles in their baths, well they do according to Instagram anyway, and they really do smell heavenly. I massaged the Willow Organic Beauty Liquid Gold Face Oil* into my skin and left it to sink in and get to work for about 20 minutes, I then added a small amount of the Clarins Gentle Refiner Exfoliating Cream and worked both products into my skin using small circular motions for a further minute or two before rinsing off with warm water and the Emma Hardie buff and polish cleansing cloth, patting my face totally dry and applying a thin layer of the Vital C Hydrating Enzyme Masque for 30 minutes. I then rinsed the mask off with warm water and and patted my face leaving left it slightly wet before applying the final product- a thin layer of the Bliss triple oxygen energizing mask which I massaged into my face for 30 seconds before leaving it for five minutes to form into a thick foam then worked the product into my skin one more time before the final rinse and pat dry. -This oil is perfect to use both as a pre-cleanse and overnight (-as I’m planning on whacking out the olf fake tan later tonight I can’t use an oil on my face!). It contains organic rose oil: famed for its healing and skin balancing properties, manuka honey: world renowned for it's antibacterial and cleansing abilities, and argan oil: the world's most famous skin care oil - regenerating and hydrating. It claims to plump out the skin whilst injecting vitamins and antioxidants into dehydrated depleted skin cells, leaving you with a dewy and radiant complexion – exactly what you want your skin to look like for a big event! -I received this sample as part of a Clarins gift set a few months ago and have been regularly mixing a small amount of this exfoliating cream with Microbeads into my cleansers ever since for super gentle exfoliation. Containing Soothing extracts of Mimosa Tenuiflora and Elderberry it ensures any flaky surface cells are banished leaving smooth and refined skin behind - with absolutely no irritation. -This mask is billed as a fast-acting foamy face mask that brightens, tightens and revives dull, sallow skin. The best thing about this mask is definitely the foamy part, it’s ridiculously fun to use as it as it means you can give yourself a Santa’s Beard, if that’s how you roll (-that’s how I roll), and is a face mask even your most reluctant friend, boyfriend , parent or sibling will be itching to try for themselves. ‘Fluid 02 technology’ delivers glow-giving oxygen to skin ad it contains powerful antioxidants and the most active powerful form of Vitamin C available. – Please stay that way for tomorrow!